Density and speed of sound measurements have been performed, at atmospheric pressure, using an Anton Paar digital vibrating tube densitometer for pure ethanol, 1-octanol, n-hexane, furan and eugenol, from 278.15 to 323.15 K and for the binary mixtures of furan + ethanol, furan + 1-octanol, eugenol + 1-octanol and eugenol + n-hexane from 278.15 to 323.15 K. Excess molar volumes were calculated and compared. The Redlich–Kister correlation was used to correlate the data. In order to identify the most important molecular interaction contributing to the excess molar volume, the Prigogine–Flory–Patterson theory was applied to correlate and predict the excess molar volumes of the mixtures. 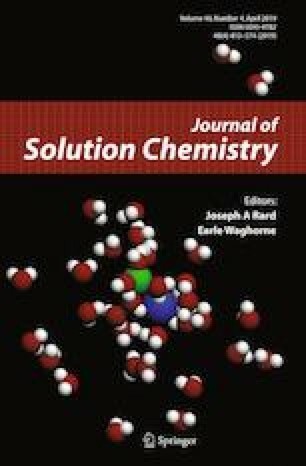 The online version of this article ( https://doi.org/10.1007/s10953-019-00870-6) contains supplementary material, which is available to authorized users. Financial support from the ANR of France through the project Memobiol (ANR-09-CP2D-10-04 MEMOBIOL) is gratefully acknowledged.